Summary and Definition: The Maidu tribe were a California tribe of Native American Indians who were hunter-gatherers and fishers. The Maidu tribe inhabited the Sierra Nevada and the adjacent valleys of northern California. The Maidu were a semi-nomadic people who hunted in the summer, building wigwams (wikiups) as temporary shelters. In the winter lived in semi-subterranean pit houses or earth lodges. What was the lifestyle and culture of the Maidu tribe? The Maidu tribe inhabited Sierra Nevada and the adjacent valleys of northern California. They were neighbors to the Wintun tribe, with whom they were frequently traded. The opening of the Oregon and California trail brought white settlers, travelling in wagon trains, who invaded their lands. The discovery of gold in California increased the number strangers and gold rush settlers inundated their homeland. The Maidu were fierce defenders of their diminishing territory but the numbers of their people swiftly diminished as they succumbed to European diseases such as malaria, smallpox, measles and influenza. The white settlers encroached their lands building using natural resources to build fences and settlements. Oak trees were cut down and acorns, a staple element of their diet, became very difficult to obtain as were roots, bulbs, fruits and other nuts. Mining activities interfered with the salmon runs. Wild game was depleted as more people hunted for food. The lifestyle of the Maidu was ruined and many suffered from starvation. In 1863 the Maidu people were forced onto the Round Valley Reservation. What language did the Maidu tribe speak? The Maidu tribe spoke in the Penutian language The Maidu people were comprised of three groups. The Northeastern or Mountain Maidu lived on the upper North and middle forks of the Feather River. The Northwestern or Konkow lived below the high Sierra and in the Sacramento Valley. The Southern Maidu or Nisenan occupied the American, Bear, and Yuba Rivers. Where did the Maidu tribe live? The Maidu are people of the California Native American cultural group. The geography of the region in which they lived dictated the lifestyle and culture of the Maidu tribe. What did the Maidu tribe live in? 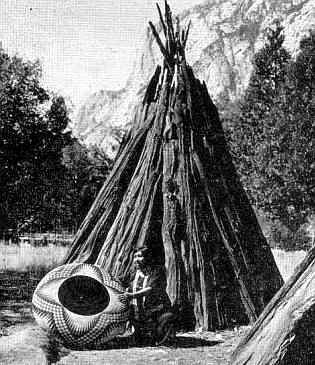 Wikiups: During the summer the semi-nomadic California Maidu tribe lived in temporary pointed, conical cedar bark shelters, constructed using several poles tied together that were covered with bark, sticks over the framework. Winter Pit Houses / Earth Lodges: The more permanent winter homes of the Maidu consisted of villages of rectangular, semi-subterranean winter homes that were set about three feet into the ground. The pit house was constructed of dirt sidewalls, wood end walls and a pitched roof. The Maidu winter houses had a central fire pit. An opening in the roof allowed the smoke to escape and also let light and air in. What clothes did the Maidu men wear? The clothes worn by the men of the Maidu tribe varied according to the seasons and the weather. During the summer months the men wore a breech cloth or simply went naked. In the winter months warm clothing was needed. Their clothes were made from the hides of animals such as deer (buckskin), elk, squirrel, rabbit and wildcats. The items of Maidu clothing included warm fur robes and cloaks, shirts, wrap-around kilts, mitts and leggings that were decorated with fringes. They wore one-piece moccasins with a front seam whilst hunting or traveling, but went barefoot in the warm weather. 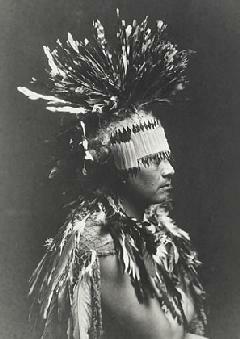 The ceremonial crown-style headdress of the Maidu, as seen in the above picture, consisted of a flicker quill headband that covered the forehead and was tied at the back. (The flicker bird is a member of the woodpecker family). The Flicker headbands were made from flicker the longest and narrowest wing feathers. These dark pink or yellow feathers were placed side by side and sewn together to form a long headband. These were bordered by dark brown feathers and attached to the head with twined string. Feather hair plumes were added as a separate form of decoration to complete the headdress. What clothes did the Maidu women wear? The type of clothes worn by the women of the Maidu tribe included blouses and front and back aprons made of shredded willow bark. Their dress fell to calf length and were belted, fringed. Special clothes were strung with ornaments, tassels and porcupine quills. Twined tule sandals or moccasins covered their feet and in the winter they wore fur robes to keep out the cold. What food did the Maidu tribe eat? A staple food of the Maidu were the acorns from the oak trees that provided an abundance of these nuts. The acorns were gathered from the Californian white, black and tan oak trees and the huckleberry oak and the bush chinquapin that grow in the northeastern mountain region. The acorns which were soaked in water or left until they turned black in order to remove the taste of bitter tannic acid. The acorns were then roasted and eaten whole or ground into acorn meal which was used to make bread. Salmon and trout were the main types of fish eaten by the people and hunters supplied meat from deer (venison) and small game such as geese, duck, quail, rabbit and small rodents. Their protein diet was supplements by eating fruits, seeds, nuts, bulbs and roots. Insects such as crickets, grasshoppers, caterpillars and locusts were baked when fresh meat was scarce. Manzanita berries were used to make a type of cider and wild mint was used to make a type of tea. What weapons did the Maidu use? The traditional weapons used by the Maidu tribe included spears, stone ball clubs, knives and bows and arrows. What was the religion and beliefs of the Maidu tribe? The religion and beliefs of the Maidu tribe was based on Animism that encompassed the spiritual idea that all natural objects including animals, plants, trees, rivers, mountains and rocks have souls or spirits. Maidu History Timeline: What happened to the Maidu tribe? The following history timeline details facts, dates and famous landmarks of the people. The Maidu timeline explains what happened to the people of their tribe.